Side note: privacy blurring is so ugly, and I didn't bombard guests with my logo- just sayin'. 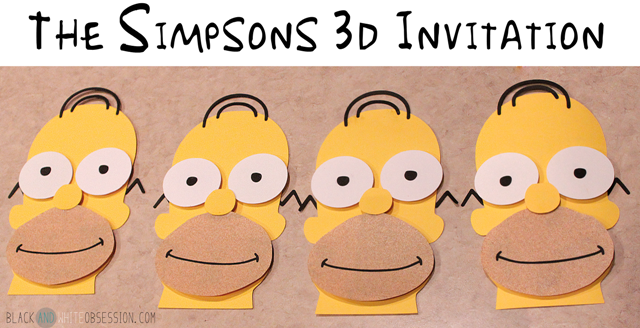 I may be biased but those 2D invitations got nothing on the 3D beauties. However, that digital version was used for the foundation of the entire project. Enough blabbing. 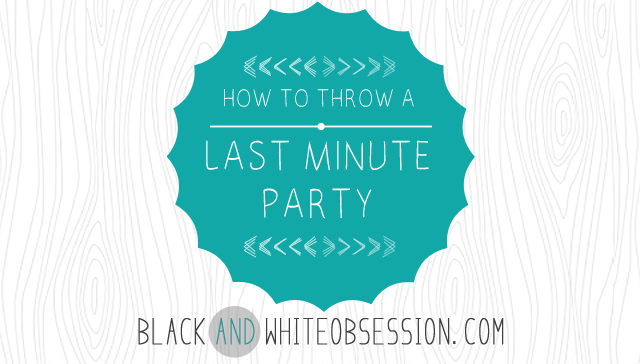 This tutorial sounds a lot harder than it seems, but with a little patience and the best MIL, they can be hammered out in an evening of giggles, a bag of Cheetos, more surprise party scheming, and lots of memories. The goal was to create a layered file to provide groundwork for the 'cut pieces' and the digital invite. 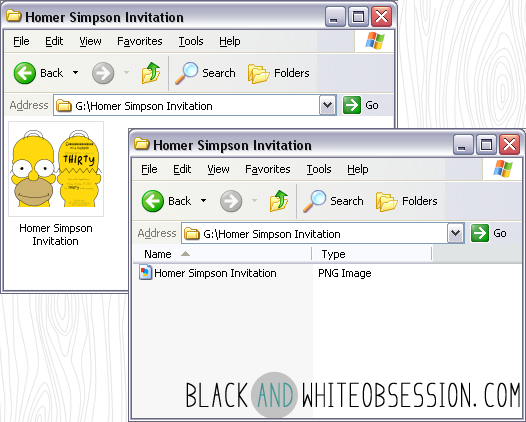 The donut, used on the invitation envelopes, was the only image "borrowed" from the internet, for personal use of course. The image required some strategic background image removal-- nothing a few minutes of editing couldn't fix. 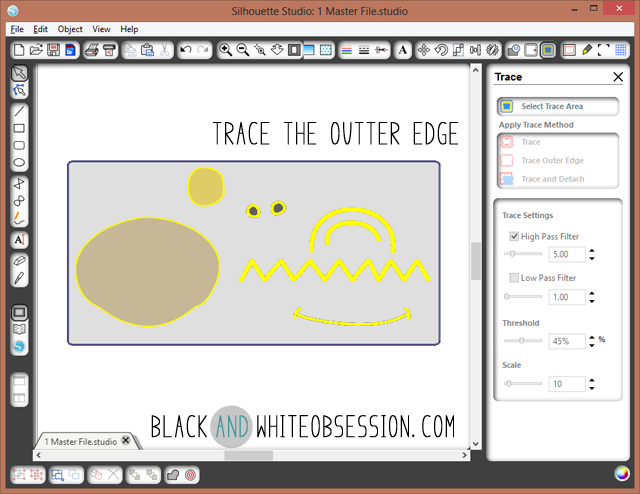 Step 2: Transfer to Silhouette Studio. 1. 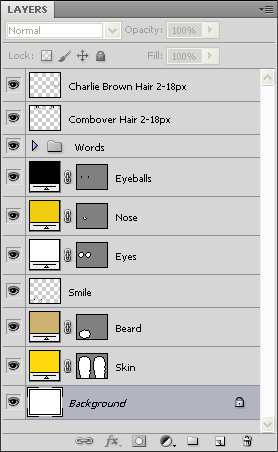 Save each piece as .png while in Photoshop. 2. 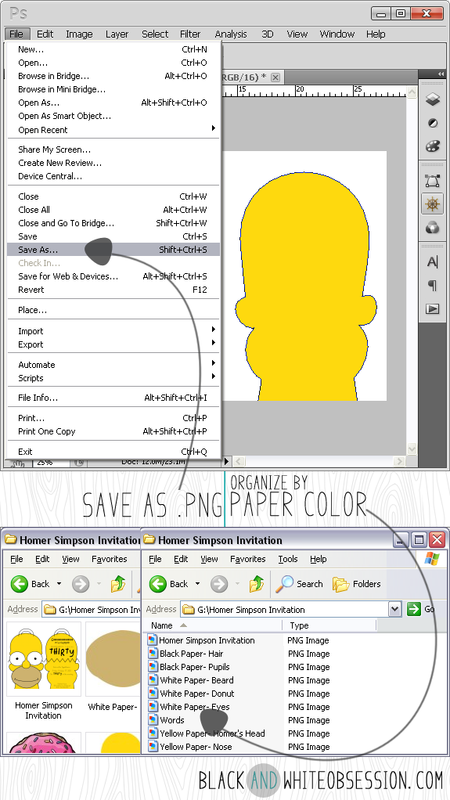 Organize the images by paper color. Yeah, I use my old XP computers (the one with all the fonts) to work on silhouette projects. It's a hard working dinosaur though. 3. Transfer the images, also by paper color, to Silhouette Studio. 4. Trace the outer edge of each image. Don't forget the donuts' inner circle. Step 3: Prepare Multiple Files. 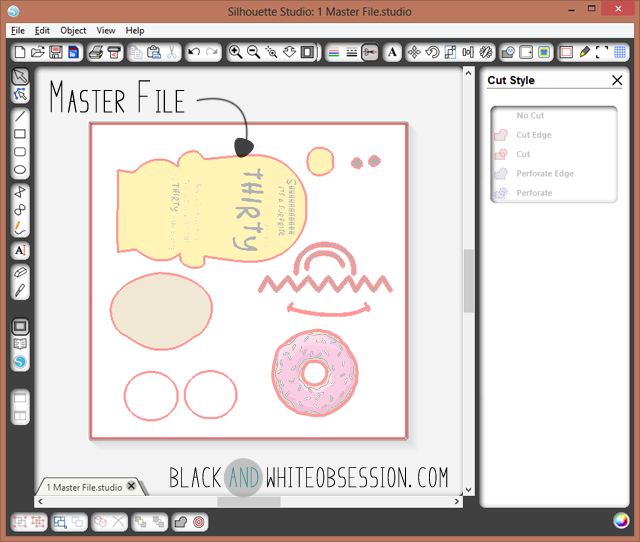 Next, create a copy your master file to work toward creating multiple files by color and type. Duplicate your images to fit as many pieces per sheet as possible (personally, I despise waste), and save each file by Color & Type. *indicates files which require print and cut. As soon as the images were prepared to cut, it was time to gather the supplies based off the invitation yield and creative duplication. 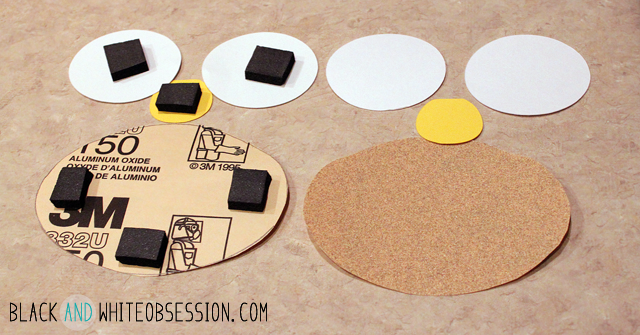 I always try to cut out 1-2 extra pieces to test my vision and have a few extras for user/blade error. 2 Homer Heads per sheet. 12 pieces of hair/pupil fit per sheet. 12 smiles per sheet with extra space. Since all the black pieces were thin lines (hair, pupils, and smiles) 3-4 extra cuts were added due to their intricacy. 1 pack of sandpaper- grit doesn't matter. Scrap paper- to test cuts and printing. After gathering all the materials, I headed over to the MIL's house to put these bad boys together for some good 'ol fashioned bonding time. It helped that she has a big kitchen with an island with lots of room away from the unsuspecting guest of honor. A white lie or two saying that I was at a movie may or may not have occurred. Since I'm nothing but cautious and didn't want to make mistakes on the minimal supplies I brought with me, we assembled a test image with some scrap yellow paper the MIL had around. 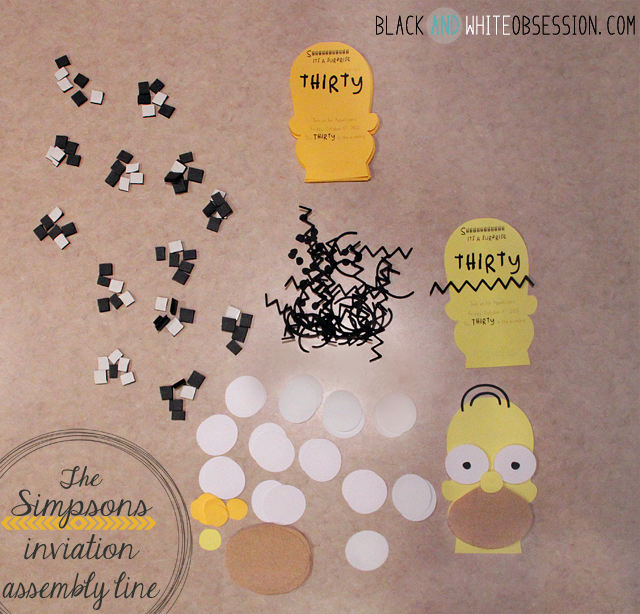 This helped us test the word placement on Homer's head, verify all the pieces fit together properly, and estimate how many foam pieces were needed per invitation. This is where we figured we needed 6 pieces of foam per invitation. Step 6: Print and Cut. Luckily everything that was being cut was the same weight card stock so the blade settings stayed the same. I found it helpful to triple check ensure the image files were matched to colors and paper sizes before hitting cut. Thankfully this is where the MIL offered her assistance. To say she was overly impressed by the abilities of the Silhouette machine would be an understatement. Side note: we're not married, I'm just super close to her-- enough that she says she loves me too when leaving her house. Next, the beard template file was cut so we could trace the shape onto the back of the sandpaper and*gasp* hand cut the beards while the silhouette cut in the background. You know, because we're efficient like that. While on the subject of efficiency, we also cut 72 (6 times 12) pieces of foam while the Silhouette did its thang. The rest of the files were cut while we were assembling in the background. We started an assembly line, weeding the images, piling them up, gluing pieces together, let them dry, and stuffing envelopes. In all, they were a labor of love, but entirely worth it for my man. Seeing my boyfriend's reaction and hearing his appreciation was the best part. He loved loved loved them!! The second best part of it all was the fact that two extremely crafty ladies in our families, I wish they were my mentors, took notice to the handcrafting and made compliments which made me beam brighter than any Tractors, Scottie's, and UFOs combined. Have you ever spent a ton of time creating something for the one you love? Do tell! P.S. I was not paid or perked by Silhouette or any other vendors, I just happily used their cutting machine to get all the precise cuts I needed. You have outdone yourself. You put so much work into this and it definitely shows. They look professional quality and are 100% awesome! Thank you Jazmin, you have NO idea how far those compliments go. As in: one crappy day in the future I may open this comment up in 20 tabs just to lift some spirits. Yeah it's a dorktastic thing. Super Cute! One of these days I'm going to break down and get a silhouette when I have time for crafting again (maybe post kitchen remodel). 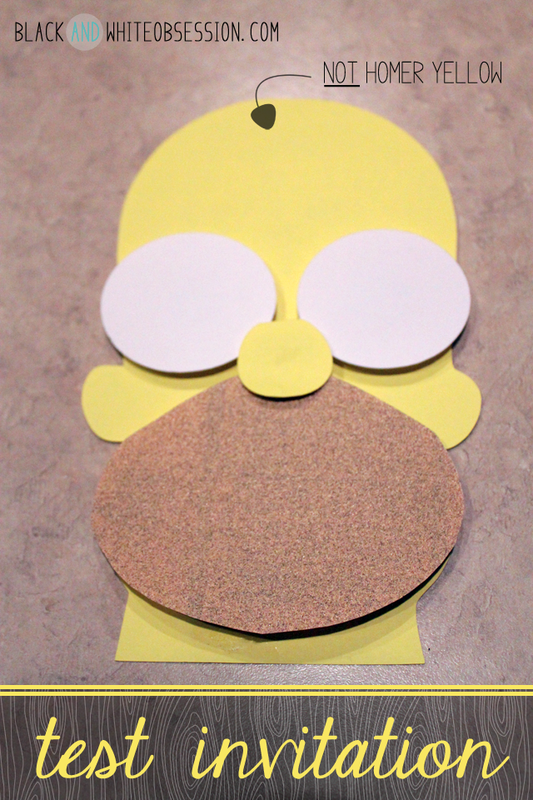 The use of sandpaper for Homer's beard is genius - I love it! Do it!! I warn you there's a bit of a learning curve but don't let that deter you from Silhouette Magic. Hello Coley, thanks for the kind words and stopping by! Glad to have ya! Thanks for the tutorial. 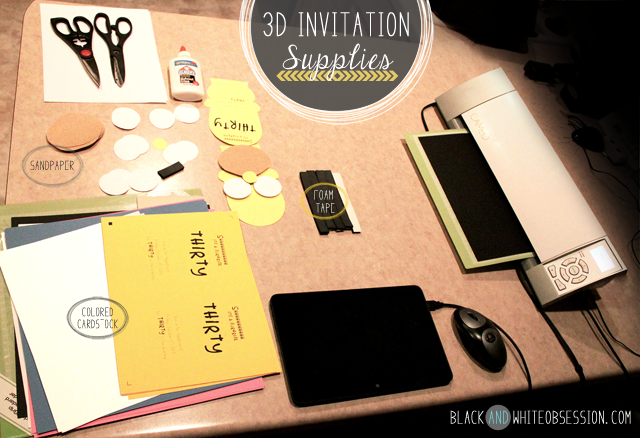 Your invitations are awesome! Hi Glenna, thanks for stopping by! You're very welcome, I hope you learned a thing or two! DeDa, watch out the machine is addicting!! There's a bit of a learning curve but it's smooth sailing once you master the basics! This is fantastic. Thank you so much for sharing! You are very talented. Thanks for the kind words Deb! Glad you stopped on by! Those are awesome! I wish I was this creative! Thanks Lisa! For me- it takes a lot of brain power to be creative. And then it's nap time- haha. It def doesn't help my productivity issues haha! 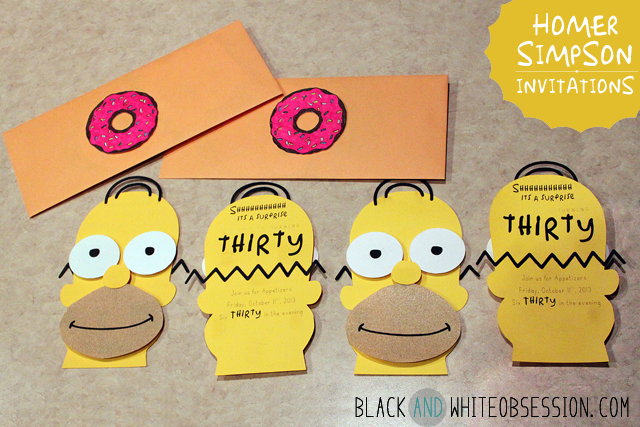 Those invitations are super cute! Thanks for the kind words, they were a lot of fun to make! These invitations are just too cute!! I love the scratchy Homer face LOL! Thanks Jen, the sandpaper was one of those early morning too good to be true kinda ideas. So glad it worked in our favor! Those invitations came out great! I'm not sure that I'm up to 3-D creations though. I'm assuming the MIL is a cutting printer? If not, do you cut all the pieces out by hand? I've never done this. So, I wasn't sure. The MIL (mother in law) and I only cut out the sandpaper faces, the rest was using the Silhouette Cameo which is a cutting machine. I totally encourage you to check out the machine-- it's very precise as opposed to our shaky hands!! What a super cute 5 o clock shadow effect! I love these! It sounds complicated outside the context of the software, but I have a feeling that you actually make it really easy to understand if you're familiar with the machine. I bought my daughter that machine last year for Christmas! wow. i'm in awe. that's amazing. love the sandpaper, nice touch!! Awe, QueenB (awesome title by the way), it's so thoughtful of you to say! Appreciate you stopping by! Love these invites! Great job! I love this! I use my cameo so often and it is truly a lifesaver. Hello again Shannah, isn't it the best machine made for DIY'ers? Wow!! Awesome invitations!! And this post rocks!! Such great detail!! Thanks so much for all your hard work in sharing this with us!! Awe thank you so much Laurie! You just made my day! These are so cute! I have often wanted to have a Silhouettte Cameo. They are so great and you can do many many wonderful things with them. Seriously, the sky's the limit with that bad boy! Thanks for stopping by! Ingenious! You are super talented. Why thank you, Robyn, you're making me blush! OMGosh I LOVE the Simpsons stuff - awesome! I love these invitations!!! How very cool! Thanks- a labor of love, but totally worth it! very cool invitations! they turned out great. Thank you, Malia, you are too kind! Well thank you Jessica! The Simpsons were a hit at the party too! This is freaking awesome and I'm freaking intimidated by your freaking crafty awesomeness. DAMN GIRL! Work it. So glad the party was a success! Thanks Cortney, so glad you could make it! !